I think it’s finally time to post a blogging income report. Now, I haven’t been making money from my blog up until 2 months ago, so that’s what I’m posting here. So, we’ll say I finally started making money with my blog after 8 months. What I’m posting below is income I’ve made from my blog from Jan 1, 2019 through March 24, 2019 — so a little under 3 months. I’m going to be honest with you here. I haven’t done anything with my blog for over a week (this week…at the time of this writing, it’s March 24). And, by nothing, I mean no pinning to Pinterest either. Nothing. Zilch. Nada. It’s not that I was lazy or didn’t feel like it, it’s because I was going through some personal stuff in my life and was seriously distracted from being able to do anything with my blog. But, my point here is not to tell you that I haven’t blogged (did you miss me, btw?) Just kidding. My point is to tell you that you really can gain from the effort you put into your blog in the past. In this past week of me doing nothing, I made 2 sales, my traffic rose 29 percent and I earned almost $6 in Google Adsense pushing me that much closer to the $100 payout (I’m at $94). So, here’s what I’ve made (this past week). Blog Traffic: 12K a month (went up 29 percent)<<<< Most of my blog traffic comes from Pinterest. I know it’s not much, but it just goes to show you that if you don’t give up, you can be rewarded for your hard work you’ve already done, even if you don’t do anything for a little while. I’m not going to bother showing a screenshot of my Amazon, because really…it’s less than $4. Now, I’ve been only able to work on my blog about an hour a day, a few days a week. So, that’s less than 10 hours a week and I haven’t quite had my blog yet for a year. So, I’m eager to see what results I’ll get by my year’s mark if I add in a few more hours a week and really work at driving traffic to my blog. I started my blog back in 2018 in May. At the time, I was watching all these bloggers claiming to be making 5 and 6 figures a month from their blog. And, I said to myself, “if they can do it, I can do it.” And, “all I need to do is give myself one year of genuine effort and don’t stop no matter what.” So, my first goal is to be making $1,000 a month from my blog. I’ve reached $405.50 so, slow and steady wins the race. Pssst…haven’t started your own blog yet? Why not? Go for it. Give yourself a full year to see where you’re at one year from now. Here’s my “Set Up Your Blog” tutorial. I first set my goal ($1,000 a month) and then I knew I had to invest in my blogging education. 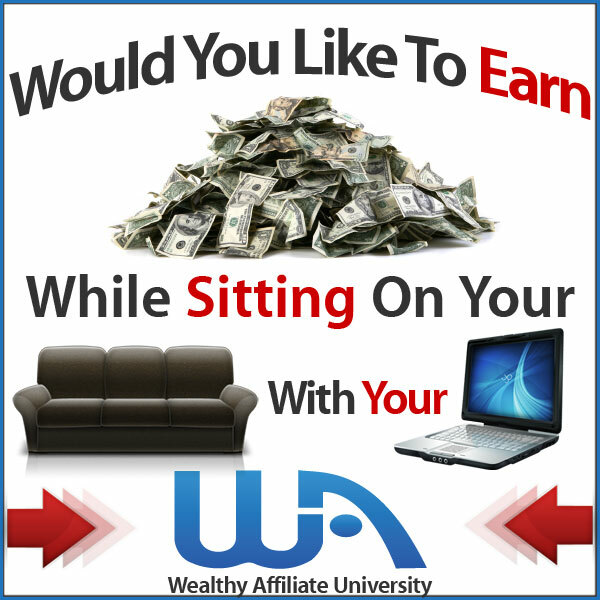 So, I joined Wealthy Affiliate. They have live webinars, recorded webinars and so much more. It’s only $19 to join and then $49 a month, so if you are struggling or just getting started with blogging, you should totally give WA a try! This is where I get my hosting and my domain name for my blog too (hosting included in the monthly fee). Everything you need is all there under one roof. Here is my thorough review on Wealthy Affiliate so you can learn more and decide if it’s a good fit for you. This is a must-have! I’ve learned so much from this ebook! This is a GREAT resource to learn how to drive traffic to your blog and build your email list with Pinterest. I’d say 95 percent of my blog traffic comes from Pinterest. I STILL have viral pins that are driving traffic to my blog daily that I pinned months ago. So, if you want to skyrocket your blog traffic, Pins to Profits will show you how. This is a GREAT resource on affiliate marketing. It has some great information and training on making money with affiliate marketing through your blog. Seriously. These three resources really complement each other. Because, making a blogging income really comes down to learning how to set up and monetize your blog, driving blog traffic (i.e. Pinterest) and implementing affiliate marketing on your blog. There are other ways to make money with your blog, but these are the main three in my opinion. So, don’t be afraid to invest in your blogging education because it will well pay for itself down the road. Okay, so, there you have it. My first blogging income report. I’ll try and post up a new blogging report once a month so you can see my progress. But, seriously, if you’ve been on the fence on starting your own blog, NOW is the time. Don’t wait, because as you can see, blogging takes work and patience. You’re going to put in the work first and then the money will start coming in slowly at first and then more consistently. Atleast that’s what I’ve been seeing with most other bloggers and that’s what I’m starting to see now with my own blog. Here’s my “Set Up Your Blog” tutorial. Let me know if I can help you in any way.